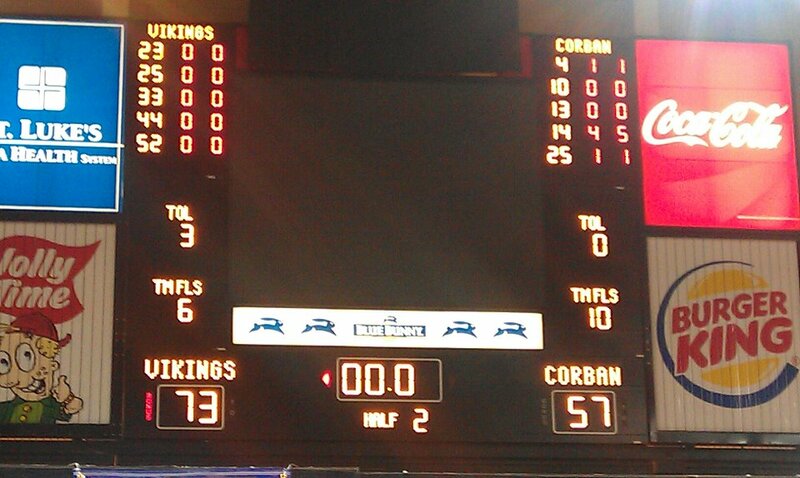 Great victory tonight by the Viking women over Corban University (Salem, Oregon) 73-57. For the 2nd time in 3 seasons, Grand View women’s basketball has made the national quarterfinals. They also have reached the 30 win plateau (against 5 losses) for the year. Tonight their All-American took over the game. After scoring just 8 points in the 16 point win over St Mary, Jenn Jorgensen scored a season high 33 points to go along with 15 rebounds. Jorgensen’s athleticism won out and powered the Vikings to victory. Morgan Hamner was a force inside and finished with 18 points. Statistics showed that free throw shooting between the two clubs could be a difference, and it was. Grand View made 22 of 28 while Corban made just 7 of 13. Coming into tonight, the Vikings made more than Corban has attempted this season (540 to 513). Saturday night’s opponent are the Bulldogs of Concordia University (Seward, NE). Like Grand View, Concordia won both their conference’s (Great Plains Athletic Conference) regular season and tournament titles. They come into the game with a record of 33-2. Kristen Conahan leads the Bulldogs averaging 14.9 points per game. Amber Kistler is next in line at 14.7. Watching Concordia’s win tonight over Cardinal Stritch (WI), one thing stood out. Their quickness. Grand View will definately have to be the more physical team. The Bulldogs don’t have a lot of size, so the Vikings will pound the ball inside to try to wear them down. Tempo will also be key. Concordia will try to run up and down the floor and full court press, while Grand View will make it more of a half court game. In GV’s first two wins here in Sioux City, their defense has been HUGE. 52 vs St Mary and 57 tonight against Corban. If the Vikings play defense Saturday they way they have so far, it will go a long way in securing a trip to the Final 4. Special mention to Jenn Jorgensen for surpassing the 2,000 point plateau. She needed 6 points tonight to break the mark and the 33 she scored gives her 2,027. An incredible accomplishment in just 3 years. Hope you can join Jon Kelly and I again Saturday night for the broadcast on 88.1 FM KDPS or online at http://kdpsradio.streamon.fm Go Vikings! Photo courtesy of my broadcast partner Jon Kelly. His caption: "Grand View women's basketball....step 2." Well said my friend. Let's take step 3 Saturday!